Henri got lots of beads! When most people think of Louisiana, they probably think of New Orleans, but there’s more to this great state than that. There’s Tiger Town…and that’s distinctly Baton Rouge. 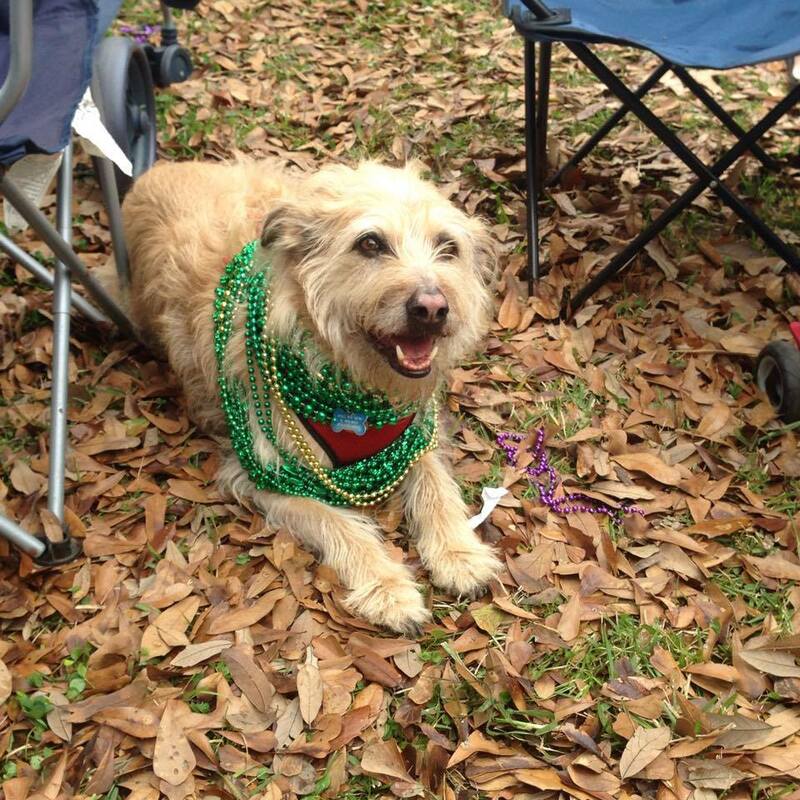 So, when my good friends announced a St. Patrick’s Day parade rolling through their neighborhood, and a crawfish boil at their house afterwards, I immediately invited myself and Henri to join them. Graciously, they accepted. Once you get past Central Arkansas and start heading south towards Mississippi, everything changes. It’s a beautiful drive and it reminds me of why I’m not likely to ever live north of the Mason-Dixon line. If I never saw another Oak lined street or a Cypress growing up out of the water and dripping with moss, I think my heart would break. Plus, the older I get, the more I hate the cold. Like, I really, really hate it. So, as the air got thicker, my heart and my dried out winter skin got happier. Our route took us south through Natchez, Mississippi then on to LA. It’s great open road and you’ll want to drive like the wind, but the wind only goes about 65 mph. The wind also frequently drops from 65 mph to 45 mph in a matter of yards, and there’s usually a cop sitting right there. No, I did not get any tickets on this drive. I’d been given fair warning. Now I’m passing that warning on to you. Roll down your windows, open the sunroof, blast the stereo and enjoy the drive. At the posted limits. After being in the car a few hours, we needed a pit stop. We took it in Lake Providence, LA. If you’re entering LA from the north on US 65 it’s the first town you’ll come to, and it’s known as the Gateway to Louisiana. The lake was once part of the Mississippi River and the cypress-lined levee protects the town from flooding. I hadn’t planned our stop for Lake Providence, but when five American flags surrounded by trees caught my attention, I turned the car around. 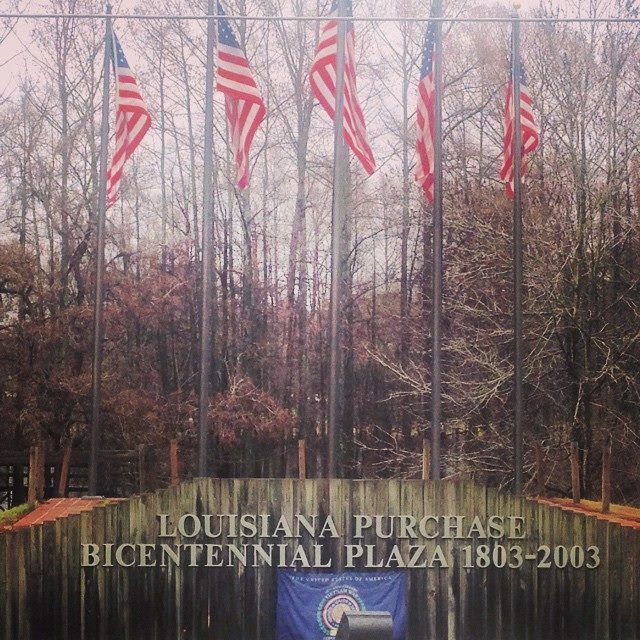 Flag Plaza honors the Louisiana Purchase. The five flags represent the countries involved in the purchase and bricks at the plaza honor local veterans from WWI to present day by name. From the plaza you can stroll the walkway that extends over the lake and winds through the trees. It was a nice little leg stretch and a chance for Henri to potty. If you’re hungry, I suggest you stop at The Dock. It’s just down the road from the plaza and has a dog-friendly patio over-looking the lake. I saw the place on the way down, but didn’t stop because I was trying to make Baton Rouge before the Razorbacks tipped-off in the quareterfinals of the SEC tournament. Unfortunately, I didn’t stop on the way back either. I took a Natchez detour for lunch and a bit of travel scouting. I wasted 30 minutes driving in circles and smelling BBQ that I couldn’t find. So here’s a travel tip. Skip Natchez unless you know someone who knows something I don’t, and save your appetite for the Southern-fried goodness, boudin, and po-boys at The Dock. I’ll be back that way and this won’t happen again! As mentioned, I was trying to make Baton Rouge in time to watch my #2 Hogs beat Tennessee. We were headed deep into Tiger territory wearing all the red: me in my Razorback shirt, Henri in his Razorback collar and red harness. We landed at The Bulldog on Perkins Road just in time. Beer tap fountain. Hogs beating TN. 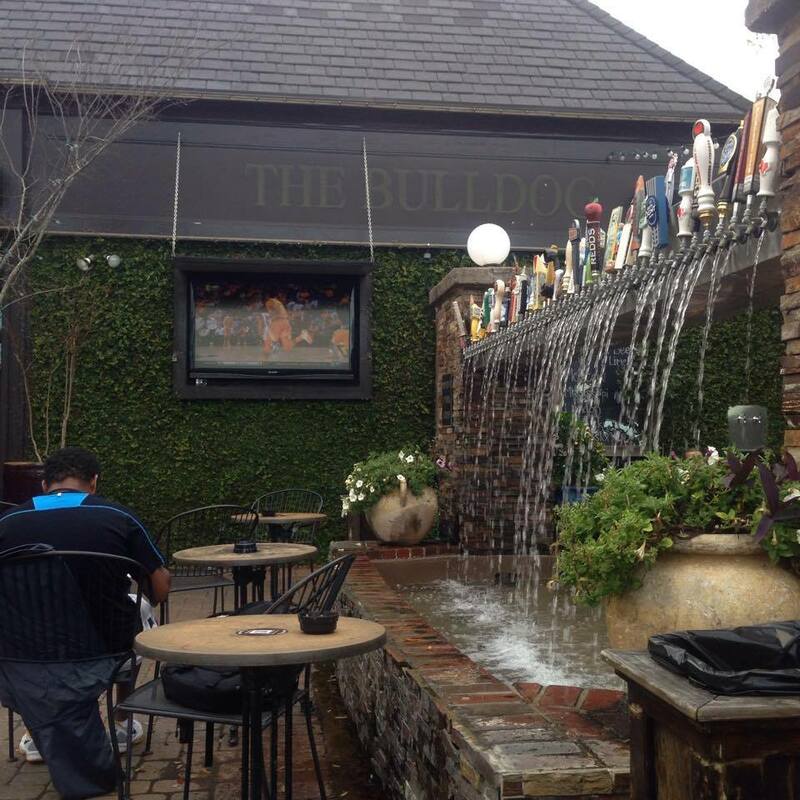 The Bulldog is a dog-friendly pub with a great outdoor beer garden and an extensive beer menu. So extensive, in fact, that I was unable to make a quick beverage decision and just told the bartender to give me something dark and bourbon barreled. That got me Abita Bourbon Street Stout, an Imperial Stout aged in bourbon barrels. They don’t have table service at the Bulldog but they do allow you to take your dog inside long enough to order your food or drinks, or to use the restroom. For those who solo on the go with a dog, this is great! I’m frequently stuck with choices I don’t like to make. Even though they don’t allow dogs to hang out at the indoor dinning tables (per health department regs), The Bulldog is truly dog friendly and very accommodating. By half time, I was ready for some food and another beer. I ordered the fish tacos for myself (Friday, y’all), and got Henri a plain chicken breast with cheese and bacon– he doesn’t care about Lent. The Bulldog doesn’t have a dog menu but I figured after 6 hours in the car, he deserved a tasty dinner. For my second beer, I went with the Randall. If you don’t know what a ‘Randall’ is, Google it, because if you’re in a pub, you should always try it. This one was a Terrapin Hopsecutioner IPA filtered through pineapple and jalapenos. I don’t usually like anything too hoppy but the pineapple seemed to cut the hops just right, and it was delicious. In fact, it was great with my fish tacos. After a Hog win, we decided it was time to go. Pushing 9 p.m., it seems we timed our exit perfectly. There was a doorman, who wasn’t there at 6, checking IDs. It was obvious they were shifting from after work happy hour to the Friday night college crowd. We added a pint glass to our tab to support local animal welfare organizations, and made our way to the car. *If you go to The Bulldog, please buy a pint glass (or order one on their web page). All proceeds support local animal welfare organizations. We like that. Saturday morning roll call was about 8 o’clock and the entire house was buzzing, except me. I don’t buzz without coffee and somebody doesn’t have a coffee pot. Note to self: find a travel press. Thankfully, the college girls were up and willing to run to Garden District Coffee. Of course, no one considered parade traffic. By the time they got back, we’d already started on mimosas. The Wearin’ of the Green Parade is in it’s 30th year in Baton Rouge and many locals think it’s better than the Mardi Gras parades. 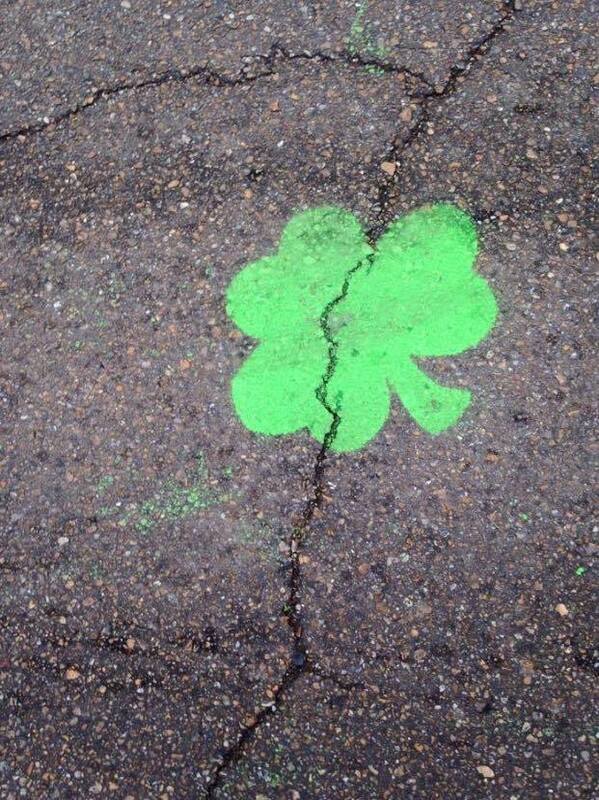 It was scheduled to roll down the shamrock chalked Terrace Street, one block over from us, at 10:00 a.m. The Dads had already hauled some chairs for the adults and a ladder for the kids to our self-proclaimed spot; the Moms and I were mixing drinks and packing the wagons. Getting six adults, four kids, one baby and a dog out the door was a parade in and of itself. We made a pretty festive looking krewe walking down the street, though. Parade Tip for Child-free Adults: Don’t let excited eight year olds hold your drink while you adjust your dog leash. They drop things. Yeti mug: keeps drinks cool and comes with a lid. By 9:30, people in all manner of greenery were crowding the grassy median on the parade route and the smell of crawfish for afternoon parties hung in the air. The houses on the route were decorated with beads and door wreaths, tailgate tents were pitched in driveways, and families and friends filled the streets with laughter. Beads were already being tossed by reverlers and missed throws dangled in the trees. Practically everyone had a cup in hand and I’m fairly certain most of it was ‘Mommy Juice’. The parade kicked off a little after 10 with the presentation of colors, followed by a group of bagpipers. This is when I had my first indication that Henri might not dig bands. The clear point was made when a group of marchers consisting only of brass and drums fired up right in front of us. I LOVED it! Henri? Not so much. I bent down to comfort him as he shook but ended up moving him off the route. After the passing of the band and a short breather to compose ourselves, we were ok.
From that point forward, when I noticed or heard a band coming toward us we moved to the driveway on the other side of the street. Thanks nice people for letting us hang out in your driveway! A thanks also goes to the people stacked behind us, who by the third band, had caught on to our trend. They not only made way for Henri to exit, but were kind enough to let us return to our group. Every time. An internet search has now led to my discovery of Mutt Muffs. After the parade: Carrying a few of Henri’s beads so he could walk. Other than the bands, we had a great time. I think Henri enjoyed himself, too. He was popular with the kids and he was very popular with the people on the floats, who would yell “For the dog!” as they threw beads at me. 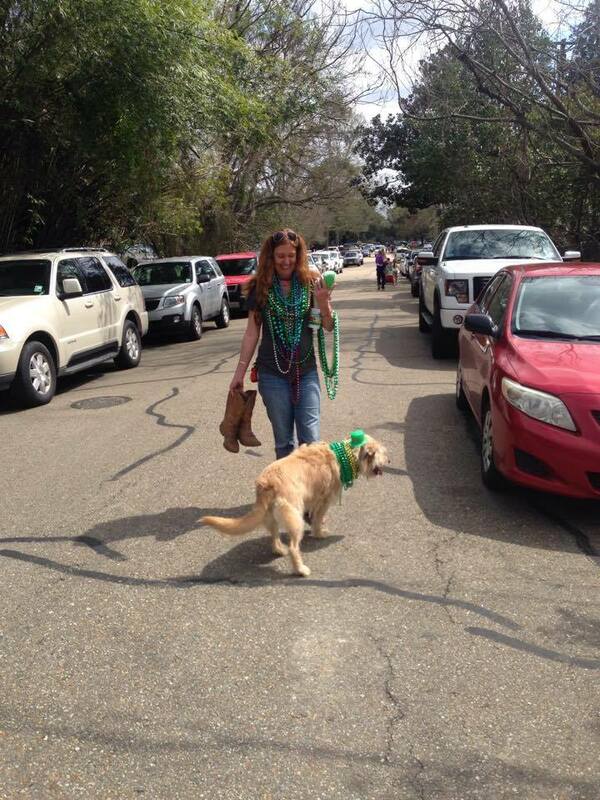 I’m actually not sure who ended up with more beads, me or Henri. After the parade, the kids loaded their bags of beads and throws into the wagons and we headed back to the house where negotiations would begin. While the guys ran off to pick up our crawfish, the kids haggled with one another over throws. The most popular item was a giant crayon with a stick of chalk in the end. There wasn’t anything worth trading for that. Not even TWO spears. The rest of our day was spent lounging on the back porch drinking and chatting with friends. Not much reason to venture out when the crawfish is boiling right next to you and the fridge is full of beer. After a day in the car, followed by a parade, Henri, too, was content to lie in the sun and do nothing. On Sunday morning, we made another Garden District Coffee run then turned leftover crawfish and potatoes into brunch. After my girlfriend, who was in Girl Scout cookie hell, handled Mommy business, we hopped in the car for a downtown tour. We made Lucy’s Retired Surfer’s Bar with their doggie menu our first stop. Lucy’s is a laid back spot that is very dog-friendly. They even feature a special menu for the ‘Surf Dog’. Canine choices include a hot dog minus the bun, chicken breast, a 3 oz ‘Juicy Lucy’ burger patty, or scrambled eggs. Our waitress greeted us, gave Henri a scratch, and immediately returned with a bowl of ice water. For the humans, Lucy’s has surfer inspired dishes ranging from salads to tacos. On Saturday and Sunday, it’s a popular place for brunch due to the ‘bottomless mimosa’ for $8. Since we’d had mimosas on Saturday, we decided to try the frozen Mind Erasers served in a hollowed out pineapple. With less self control and a designated driver, we might have been delayed all day! The were only two drawbacks to Lucy’s. The first is that dogs are ONLY allowed on the patio and the restrooms are located in the back of the restaurant. If you’re alone with your dog, that’s a problem. The manager did tell me that at less busy times a staff member (or restaurant regular) would be happy to wait with your dog. The second problem was the music seemed awfully loud for a Sunday afternoon. Maybe I’m old, but I like to hear the person next to me talk. 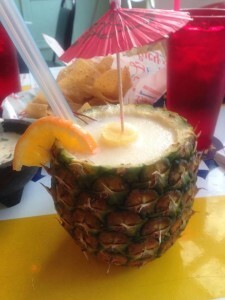 Other than that, our drinks and service were great and our waitress was very nice to Henri. If you’d like to pack up the family, dog included, of course, and head somewhere for a weekend, Baton Rouge isn’t a bad option. North Boulevard Town Square hosts Live After Five– a free concert series- every Friday night until the end of May, and a Saturday morning farmer’s market. Repentance Park features an arc walkway with seating, a fountain space with 750 jets, and a great lawn space where kids were tumbling and rolling down the grassy hill. For even more fun, look for the Repentance Park Toy Boxes filled with footballs, basketballs, soccer balls and Frisbees; they’re for anyone to use. *In October 2016, Mike VI passed away at the age of 11 after a long battle with a rare form of cancer. RIP Mike. You were loved.